Today, Samsung announces yet another milestone, this time with its low-powered memory. You see, Samsung has created what it calls the "industry's first 10-nanometer (nm) class 8-gigabit (Gb) LPDDR5 DRAM." The company promises significant power reduction -- up to 30 percent over LPDDR4X DRAM. This should be important for the upcoming 5G explosion. "The 8Gb LPDDR5 boasts a data rate of up to 6,400 megabits per second (Mb/s), which is 1.5 times as fast as the mobile DRAM chips used in current flagship mobile devices (LPDDR4X, 4266Mb/s). With the increased transfer rate, the new LPDDR5 can send 51.2 gigabytes (GB) of data, or approximately 14 full-HD video files (3.7GB each), in a second," says Samsung. 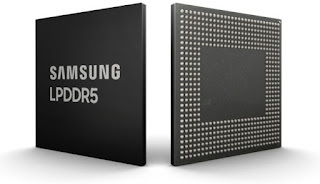 The Galaxy-maker further says, "The 10nm-class LPDDR5 DRAM will be available in two bandwidths -- 6,400Mb/s at a 1.1 operating voltage (V) and 5,500Mb/s at 1.05V -- making it the most versatile mobile memory solution for next-generation smartphones and automotive systems."